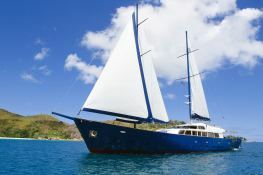 Here is a magnificent and big sailing vessel made for long haul cruising. The sails are equipped with a modern furling system, with a total surface of 500 m2. 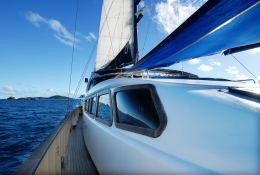 With her powerful rig and large sail area, sailing yacht SBS can drive along at a good speed in any weather condition. 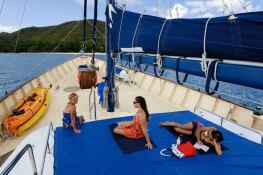 Sailing yacht SBS gives the opportunity to reach the best dive sites in the Seychelles inner and outer islands and is equipped to host up to 16 divers with unlimited diving and flexible itinerary. The crew includes PADI instructors with years of Indian Ocean experience. Available on board: 18 Dive cylinders aluminium 12 Litres, 2 dive compressors, different size wet suites for rent, 8 full diving sets for rent. Because of its large size, high fuel capacity and powerful engine the boat can cover long distances at a good speed and comfort in almost any sea condition, opening up new possibilities for exploring Seychelles. This crewed sailing yacht is available for yacht charter with a base price of 33 000 € (approximatly 37 216 $).